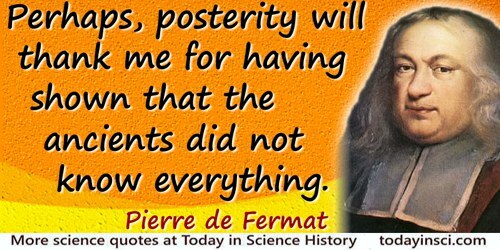 And perhaps, posterity will thank me for having shown that the ancients did not know everything. 'Relation of New Discoveries in the Science of Numbers', in Letter (Aug 1659) to Pierre de Carcavi, an amateur mathematician, collected in OEuvres de Fermat: Correspondance (1894), 436. Translation, used as an epigraph, in D.M. Burton, Elementary Number Theory (1976, 1989), 107. I have found a wonderful solution to Fermats’ Last Theorem—but my train is leaving. Graffiti on wall of subway, New York. As quoted in William Reville, 'The Science of Writing a Good Joke', The Irish Times (5 Jun 2000). 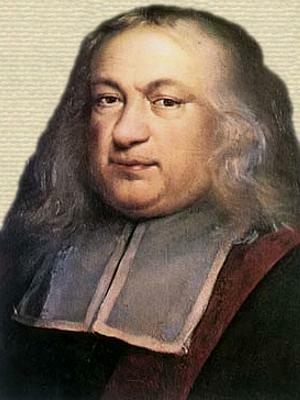 17 Aug - short biography, births, deaths and events on date of Fermat's birth. Fermat's Enigma: The Epic Quest to Solve the World's Greatest Mathematical Problem, by Simon Singh. - book suggestion.